Mayo Clinic Internal Medicine Board Review: Questions and Answers is designed specifically to help prepare physicians-in-training and practising clinicians for the ABIM certification and maintenance-of-certification examinations in internal medicine. 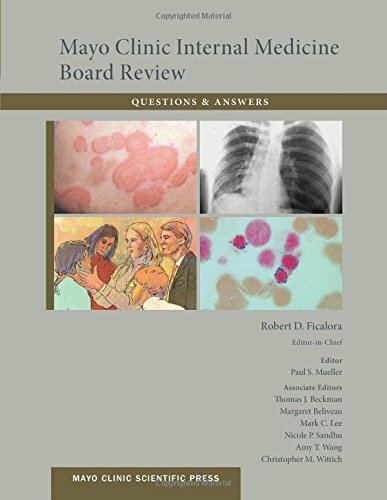 This question-and-answer companion to Mayo Clinic Internal Medicine Board Review, 10th Edition, tests physicians and physicians-in-training on all relevant material related to the goals set forth by ABIM to ensure the success of internal medicine clinicians. To facilitate study, alleviate potential distractions and simplify quick reference, this book is organized according to its companion text. Each chapter is devoted to the study of a particular subspecialty topic (e.g. allergy, cardiology, dermatology, etc.) and cross-content referenced to topics related to general internal medicine (e.g. men's health, women's health, geriatrics, etc.) Chapters feature anywhere from 5 to 50 questions, each structured as a potential patient encounter with multiple-choice diagnostic and treatment responses. By testing physicians-in-training and practising clinician's knowledge of internal medicine and clinical thinking skills, Mayo Clinic Internal Medicine Board Review: Questions and Answers seeks to promote the best education and care in internal medicine.